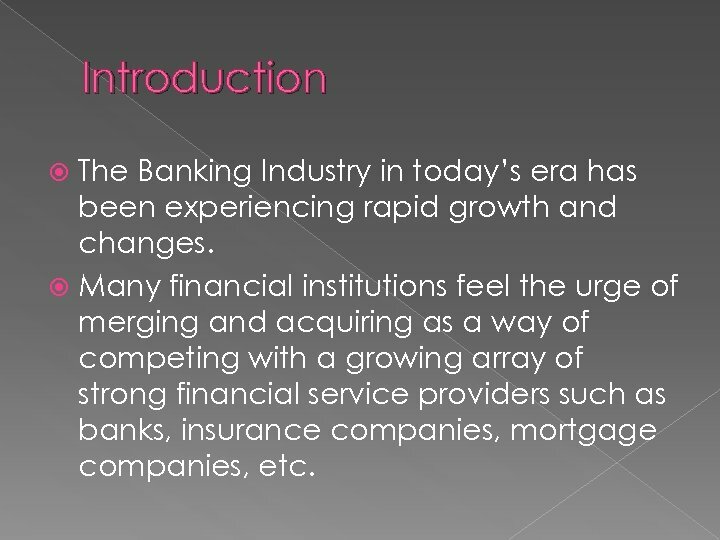 Introduction The Banking Industry in today’s era has been experiencing rapid growth and changes. Many financial institutions feel the urge of merging and acquiring as a way of competing with a growing array of strong financial service providers such as banks, insurance companies, mortgage companies, etc. 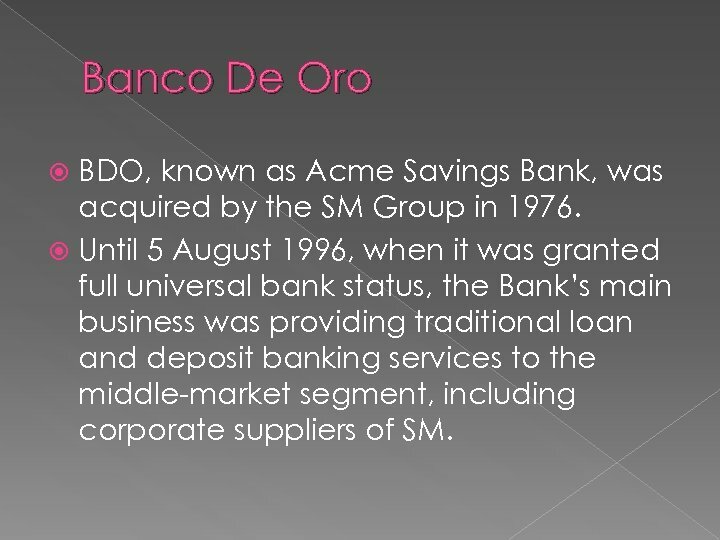 Banco De Oro BDO, known as Acme Savings Bank, was acquired by the SM Group in 1976. Until 5 August 1996, when it was granted full universal bank status, the Bank’s main business was providing traditional loan and deposit banking services to the middle-market segment, including corporate suppliers of SM. 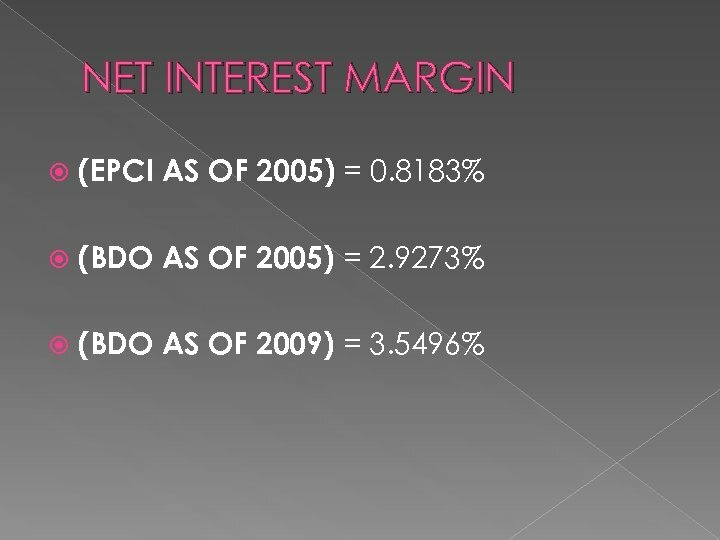 BDO listed its shares in the Philippine Stock Exchange (PSE) on 21 May 2002. 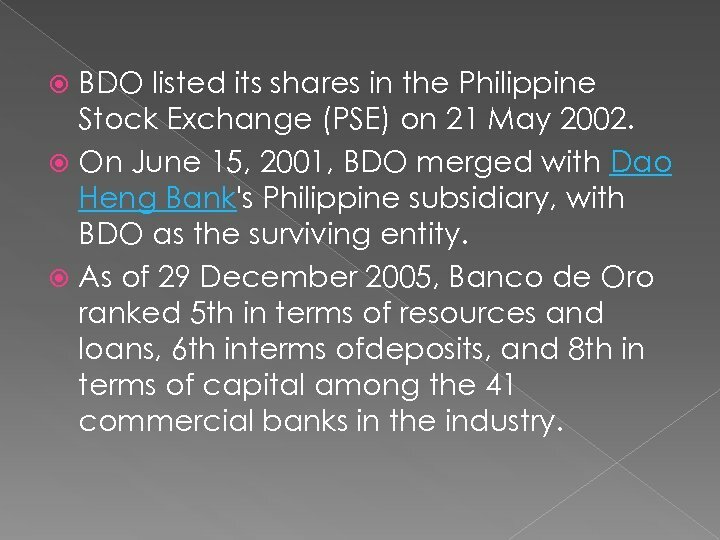 On June 15, 2001, BDO merged with Dao Heng Bank's Philippine subsidiary, with BDO as the surviving entity. 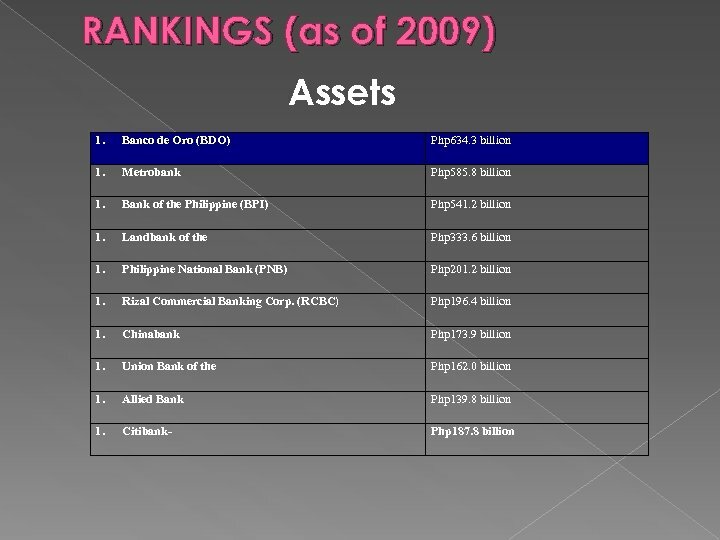 As of 29 December 2005, Banco de Oro ranked 5 th in terms of resources and loans, 6 th interms ofdeposits, and 8 th in terms of capital among the 41 commercial banks in the industry. 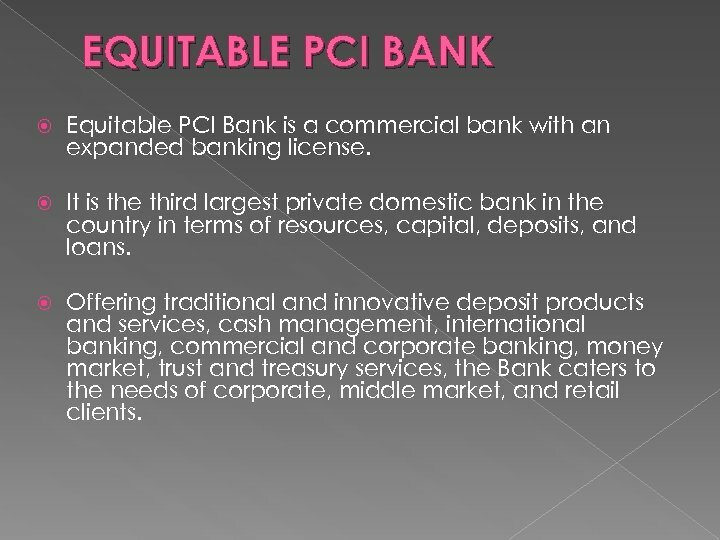 EQUITABLE PCI BANK Equitable PCI Bank is a commercial bank with an expanded banking license. It is the third largest private domestic bank in the country in terms of resources, capital, deposits, and loans. Offering traditional and innovative deposit products and services, cash management, international banking, commercial and corporate banking, money market, trust and treasury services, the Bank caters to the needs of corporate, middle market, and retail clients. 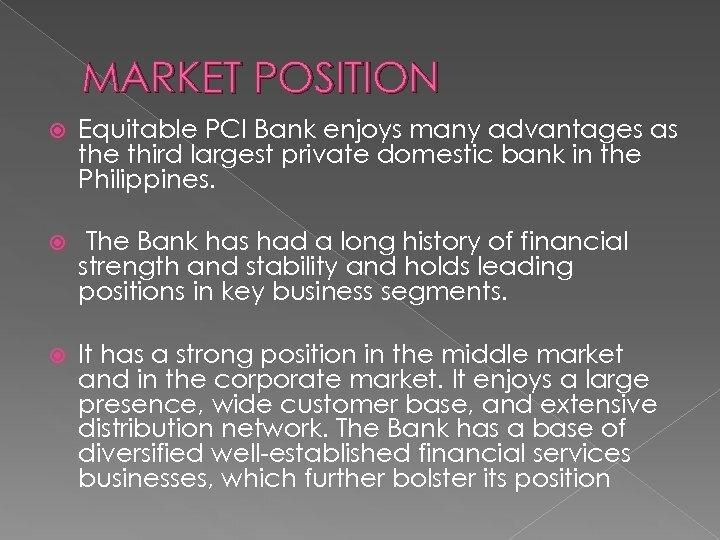 Combining the individual strengths of Equitable Bank and PCI Bank, the merger in 1999 created a strong presence insignificant market segments particularly the corporate and Filipino-Chinese middle market. 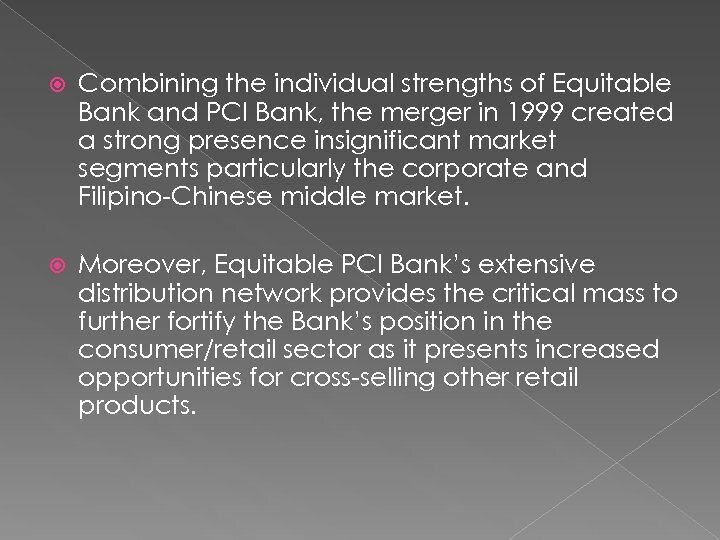 Moreover, Equitable PCI Bank’s extensive distribution network provides the critical mass to further fortify the Bank’s position in the consumer/retail sector as it presents increased opportunities for cross-selling other retail products. 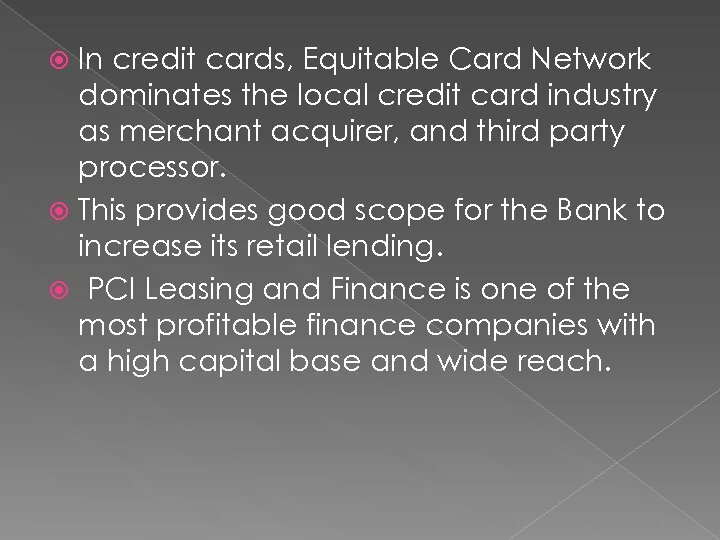 In credit cards, Equitable Card Network dominates the local credit card industry as merchant acquirer, and third party processor. This provides good scope for the Bank to increase its retail lending. PCI Leasing and Finance is one of the most profitable finance companies with a high capital base and wide reach. 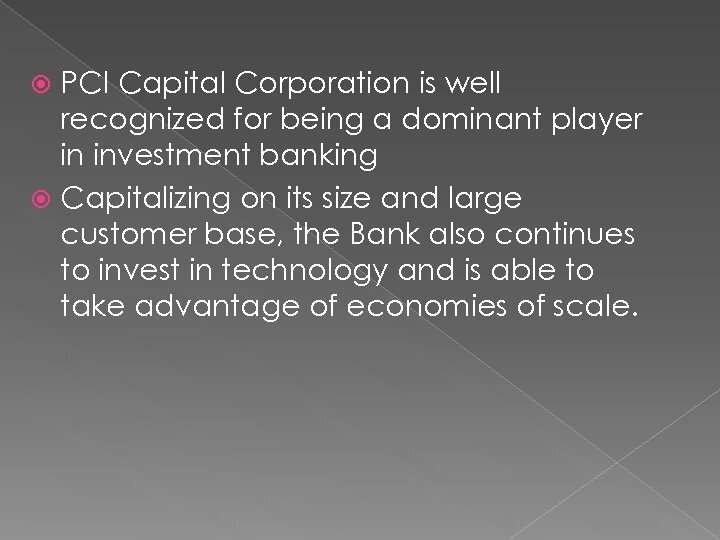 PCI Capital Corporation is well recognized for being a dominant player in investment banking Capitalizing on its size and large customer base, the Bank also continues to invest in technology and is able to take advantage of economies of scale. 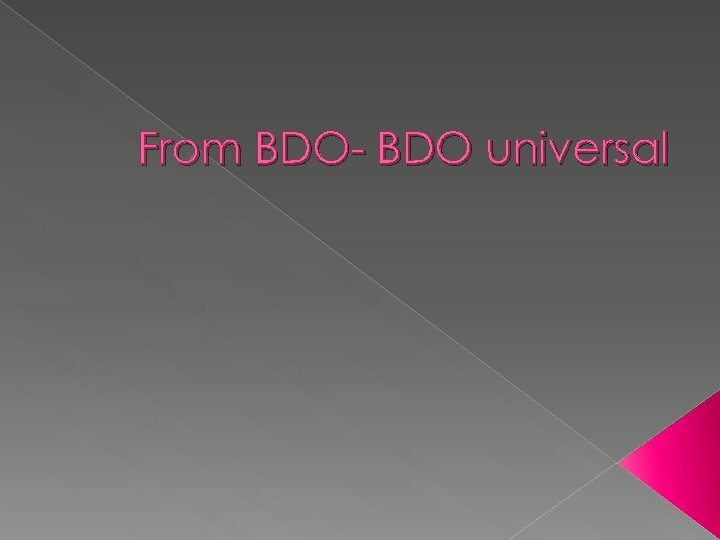 The combination of the branch networks and other businesses of BDO and EPCI will enable them to: To serve its customers better and more efficiently than either institution alone To invest in the most up-to-date technology and develop more innovative products which will benefit both retail and corporate customers Will be better able to upgrade its risk management and IT systems in order to address Basel II requirements. 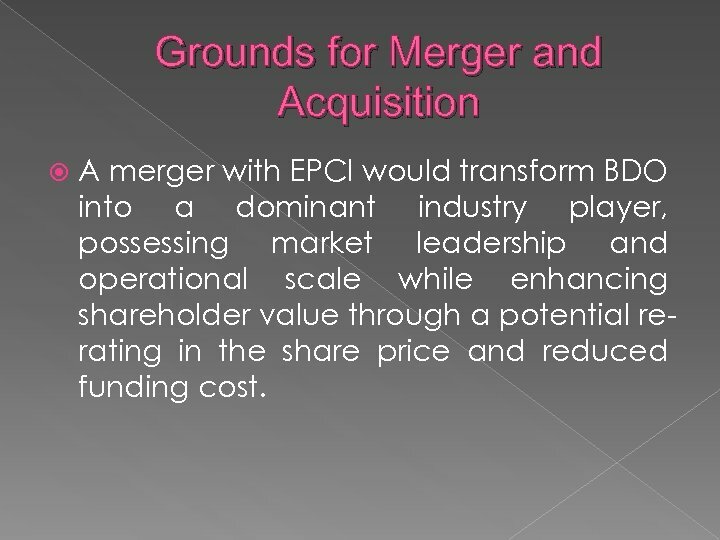 Grounds for Merger and Acquisition A merger with EPCI would transform BDO into a dominant industry player, possessing market leadership and operational scale while enhancing shareholder value through a potential rerating in the share price and reduced funding cost. Osmena v. Social Security Commission, G. R. No. 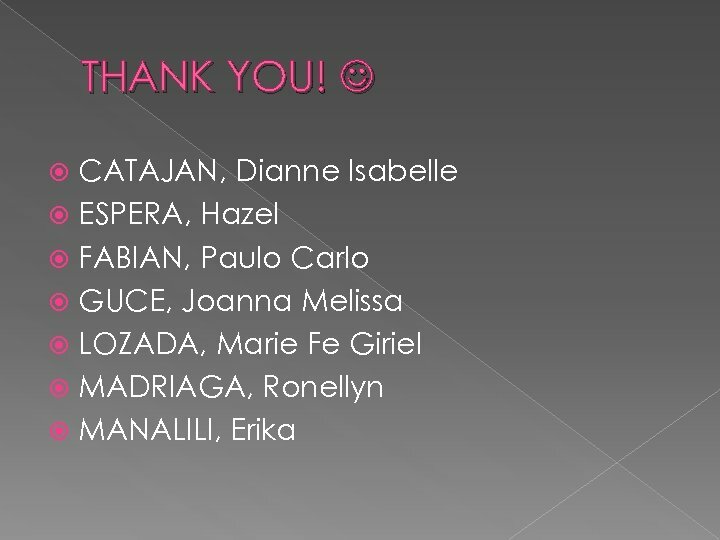 165272, September 13, 2007 On August 5, 2005, Banco de Oro and SM Investments Corporation, another member of the SM Group, acquired 24. 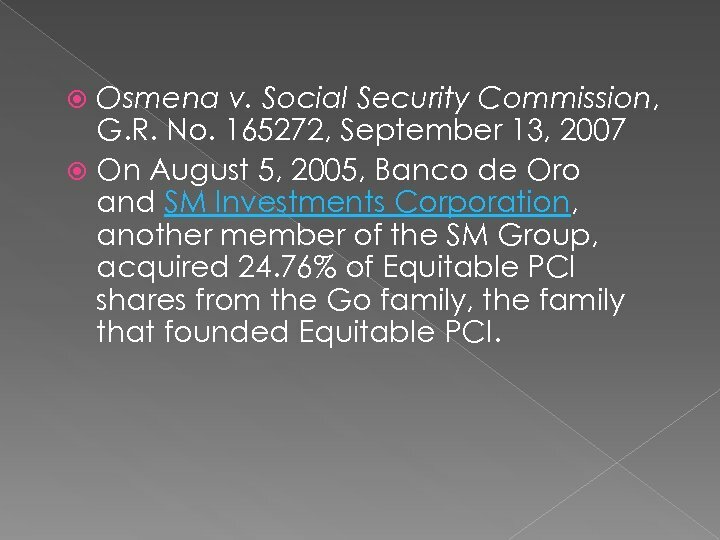 76% of Equitable PCI shares from the Go family, the family that founded Equitable PCI. 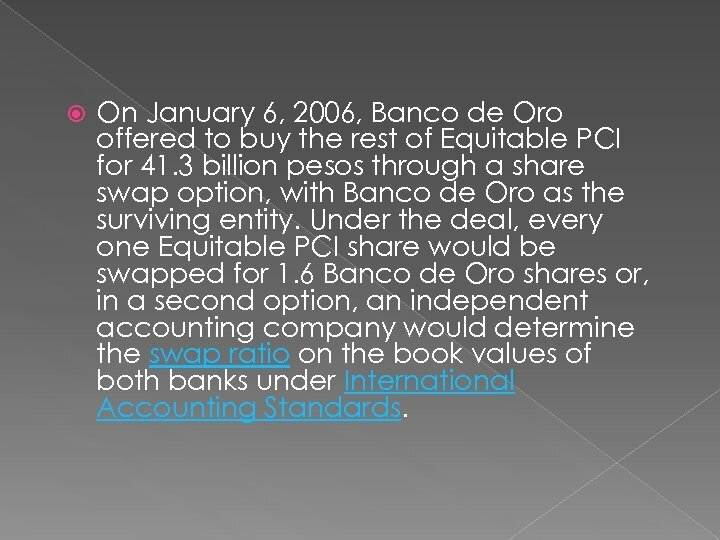 On January 6, 2006, Banco de Oro offered to buy the rest of Equitable PCI for 41. 3 billion pesos through a share swap option, with Banco de Oro as the surviving entity. 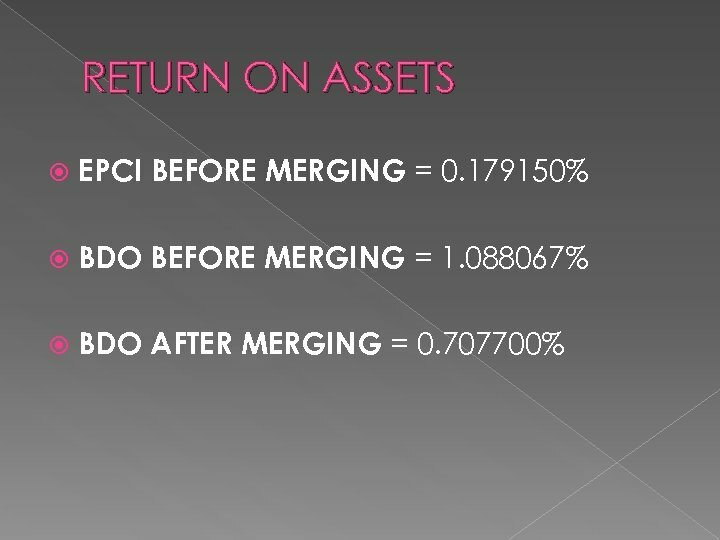 Under the deal, every one Equitable PCI share would be swapped for 1. 6 Banco de Oro shares or, in a second option, an independent accounting company would determine the swap ratio on the book values of both banks under International Accounting Standards. 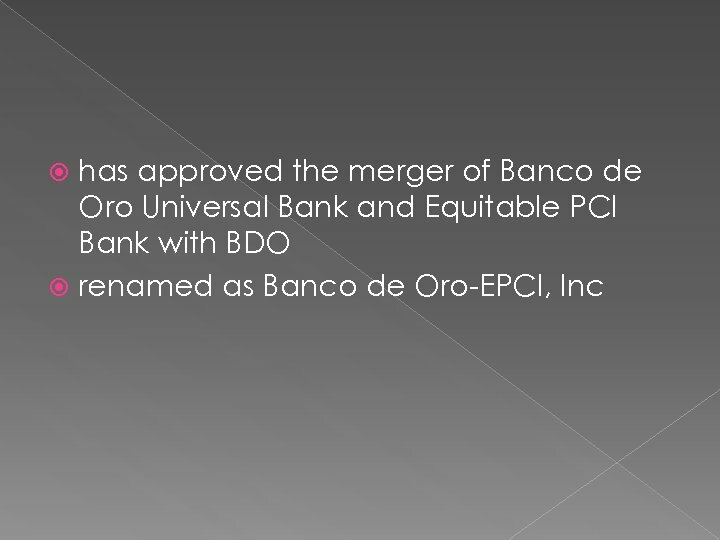 On November 6, the respective boards of Banco de Oro and Equitable PCI Bank agreed to the merger of both banks through a modified stock swap deal. Instead of the original 1. 6 shares Banco de Oro would swap for, it would swap 1. 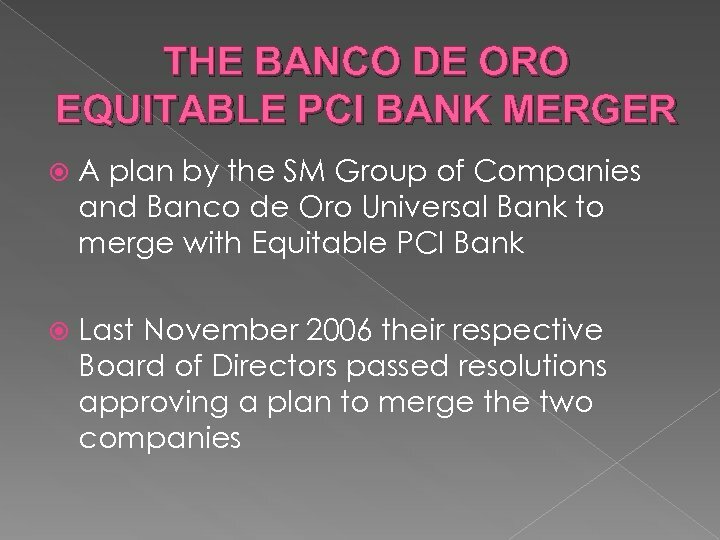 8 shares for every Equitable PCI share On December 27, 2006, Banco de Oro shareholders approved the merger with Equitable PCI Bank shareholders also approved the merger the same day. 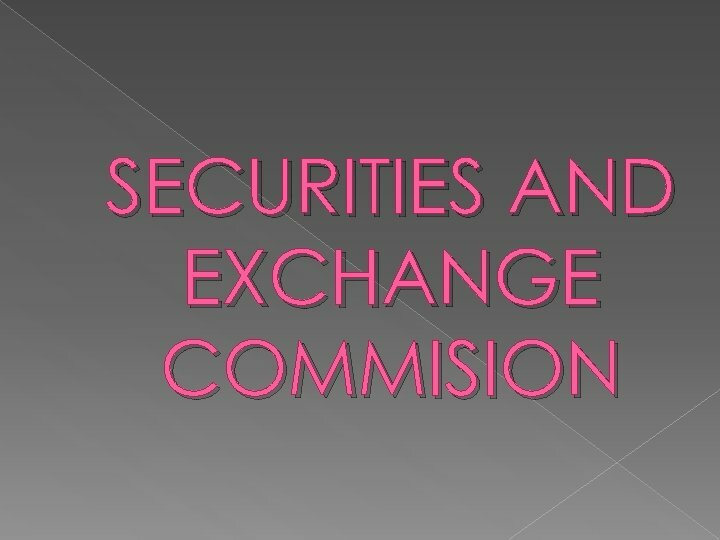 In order for the merger to take effect, approval from both the Bangko Sentral and the Securities and Exchange Commission is required, which was obtained in early 2007. 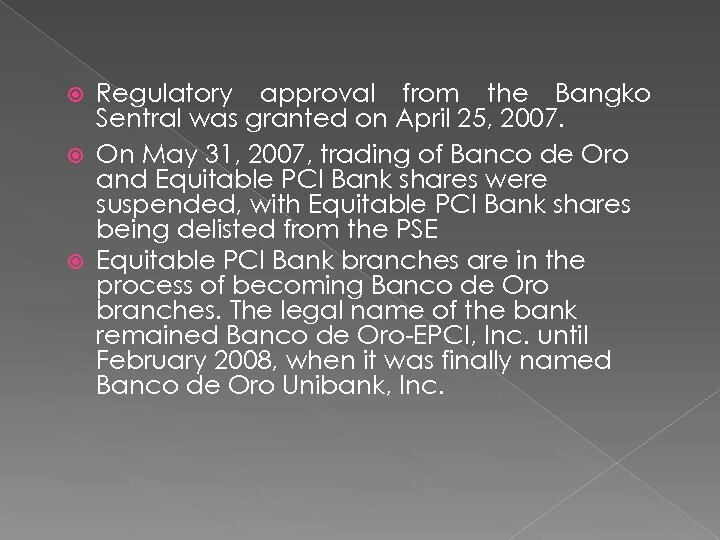 Regulatory approval from the Bangko Sentral was granted on April 25, 2007. 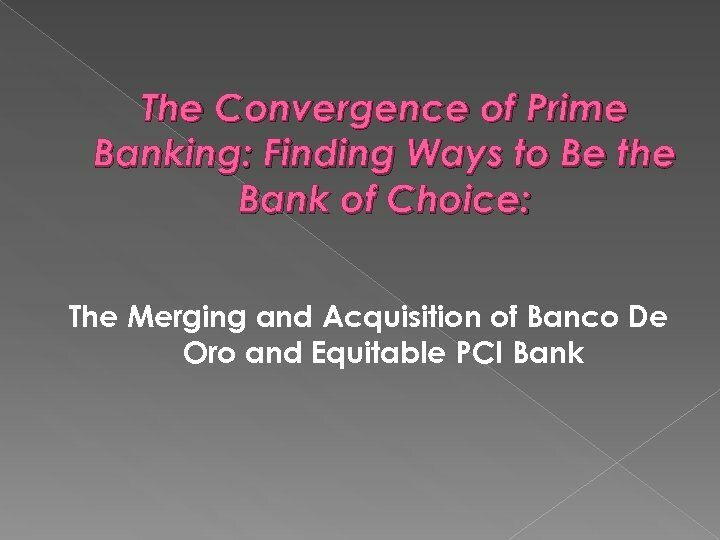 On May 31, 2007, trading of Banco de Oro and Equitable PCI Bank shares were suspended, with Equitable PCI Bank shares being delisted from the PSE Equitable PCI Bank branches are in the process of becoming Banco de Oro branches. The legal name of the bank remained Banco de Oro-EPCI, Inc. until February 2008, when it was finally named Banco de Oro Unibank, Inc. 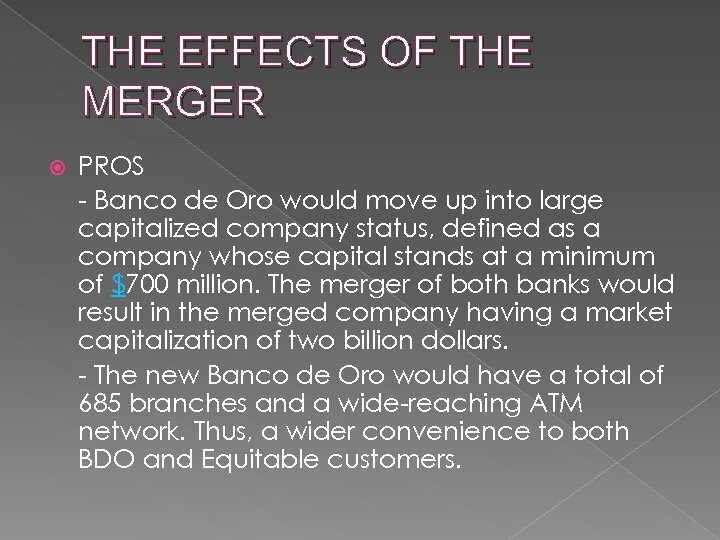 THE EFFECTS OF THE MERGER PROS - Banco de Oro would move up into large capitalized company status, defined as a company whose capital stands at a minimum of $700 million. 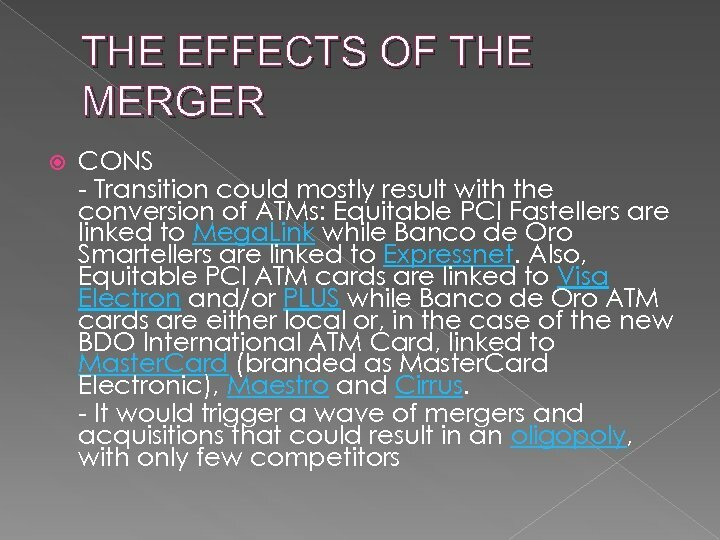 The merger of both banks would result in the merged company having a market capitalization of two billion dollars. 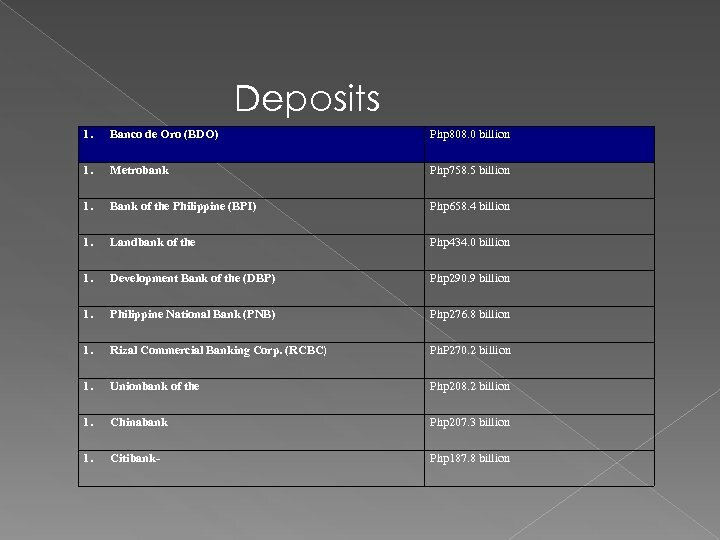 - The new Banco de Oro would have a total of 685 branches and a wide-reaching ATM network. 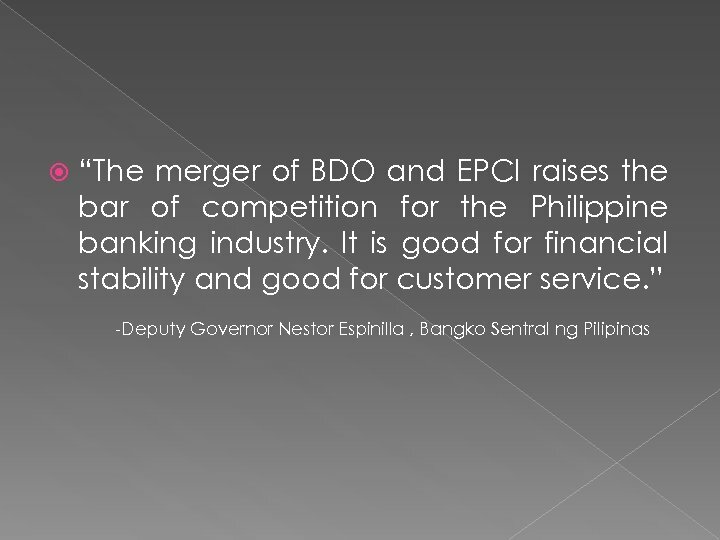 Thus, a wider convenience to both BDO and Equitable customers. 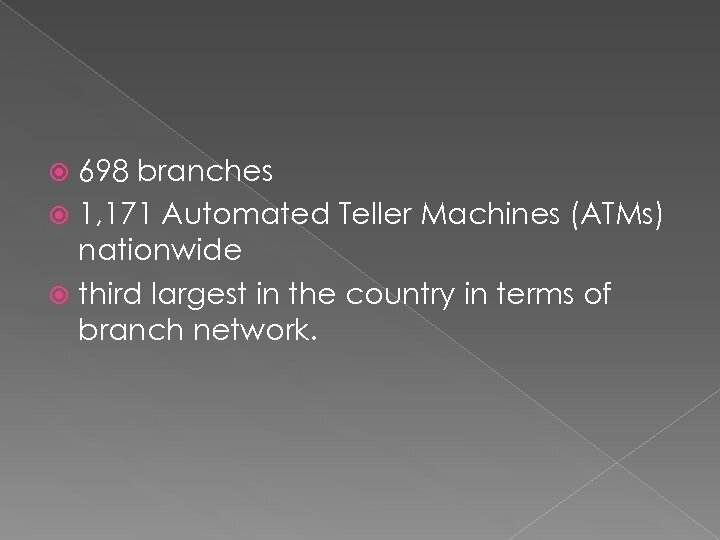 698 branches 1, 171 Automated Teller Machines (ATMs) nationwide third largest in the country in terms of branch network. 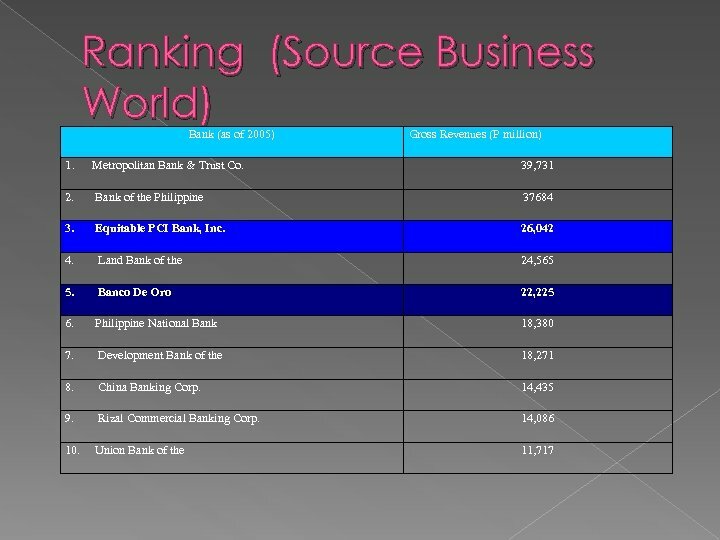 In 2001, the bank acquired the Philippine subsidiary of Dao Heng Bank, growing its branch network by 12. In April 2005, the bank further expanded by acquiring branches of United Overseas Bank.